Even if you can only lift your soldering iron, show your support for augmented strength in a limited edition Tetsujin 2004 T-shirt from SERVO Magazine. 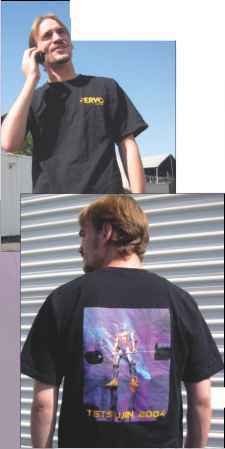 The back of this 100% cotton shirt sports a six color rendering of the ultimate strength augmentation suit, while the front has the SERVO logo. Limited quantities - when they run out that will be it! Available in sizes M, L, XL, and XXL.